Irish humor....setting the mood for our Irish seminar. "Geographically, Ireland is a medium-sized rural island that is slowy but steadily being consumed by sheep." And who said this? Humor writer Dave Barry. Ages ago when I was lucky enough to tour Ireland and as we rode around in a huge bus, I saw LOTS of sheep. LOTS of big, dirty sheep. I mean LOTS of DIRTY sheep. And we on the bus all agreed that the kindest thing you could do to a little lamb was to eat it before it turned into a big dirty sheep. For we were served lamb at nearly every dinner. Have you any Irish anecdotes to share to help get us in the mood for our Irish Seminar on March 10?? If not, see you then and there! Three BIGGEE events coming up..... are they on YOUR calendar? Saturday, March 10: This is the date for our EWGS meeting (NOT March 3, please remember) and it will be an all day, all things Irish and Scots-Irish, seminar presented by two fellows coming from Ireland to spend the day with us. 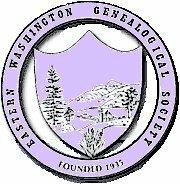 Cost is $20 for EWGS members; $25 for non-members; please bring a bag lunch. For complete information, register and access the poster via our blog our our website (www.EWGSI.org). Saturday, April 7: This is our EWGS meeting date and will be a Welcome 1940 Census Birthday Party! Complete with balloons and cake, trained volunteers will be there to attempt to find your family on the newly-released 1940 census. I say "attempt," for that census will not be indexed by that date and you'll need to have a pretty good idea where your people lived to be able to find them and we'll be there to help you! (As the year progresses, this census will be indexed by Ancestry and FamilySearch, but not by April 7th.) This is a free event. I'm homewardbounding today from attending RootsTech and it was fun to share learning with friends from home. I shared time with Cecily Kelly, Margie Beldin, Janis Littlefield (TriCities GenSoc) and Karen and Gordy Struve. Other than Gordy's mishap pinching a finger in a folding chair, we had a fab time. The thing I learned that was most impressive to me was this: We can imagine gathering most all of the world's family history information into one place. (FamilySearch and Ancestry are trying to do just that.) What we don't understand is HOW those wonderful young teckie-geeks DO IT.......how they take those million bits of information and turned them into a bezillion bytes that we can access. That was the "Tech" part of RootsTech. And it's complicated beyond my understanding for sure although I did listen and try to "see." What I do know is this, and our mutual friends agree: The future of genealogy lies with the Internet. I did not say "on" the Internet, I said "with." The time is coming when you can sit in your 'jammies and either access the data directly or search card catalogs and contact repositories directly for more information or search genealogical society websites and then contact them directly for more information. I know it blows my mind to hear explained all the many, many ways to find answers via the Internet. (Again, I did not say ON the Internet.) I thank all those teckie-geeks for helping this to become a reality for us and I'm eager to learn how to fully appreciate and use all that is becoming available to me. I hope you are too.